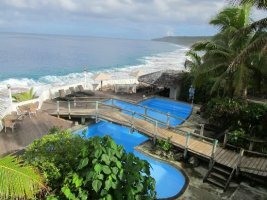 The economy of Niue is heavily dependent upon aid from New Zealand. The agricultural sector consists mainly of subsistence gardening, although some cash crops are grown for export. Industry consists primarily of small factories to process passion fruit, lime oil, honey, and coconut cream. The sale of postage stamps to foreign collectors is an important source of revenue. Niue is not a member of the United Nations, but UN organizations have accepted its status as a freely-associated state as equivalent to independence for the purposes of international law. As such, Niue is a full member of some UN specialized agencies (such as UNESCO, the WTO, and the WHO), and is invited, alongside the other non-UN member state, the Cook Islands, to attend United Nations conferences open to "all states". In 2003 Niue became the world's first "Wi-Fi nation", with the Internet Users Society-Niue providing free wireless Internet access throughout the country. The island in recent years has suffered a serious loss of population because of migration of Niueans to New Zealand. Efforts to increase GDP include the promotion of tourism and a financial services industry. Another source of income lately has been the sale of Internet domain names under the NU top level domain, which are particularly popular in Scandinavia, Belgium and the Netherlands, since nu means "now" in the Scandinavian languages and Dutch. The taro is known in Samoa as "talo Niue" and in international markets as pink taro. Niue exports taro to New Zealand. The Niue taro is a natural variety and is very resistant to pests. The government and the Reef Group from New Zealand started two joint ventures in 2003 and 2004 involving the development of the fisheries and noni (Morinda citrifolia, a small tree with edible fruit). Niue Fish Processors, Ltd is a joint venture company processing fresh fish, mainly tuna (yellow fin, big eye and albacore), for fish export to the overseas markets. NFP operates out of their state-of-the-art fish plant in Amanau Alofi South, completed and opened in October 2004. Agriculture is very important to the lifestyle of Niueans and the economy, and around 204 square kilometers of the land area are available for agriculture. Subsistence agriculture is very much part of Niue's agriculture, where nearly all the households have plantations of taro. Taro is a staple food, and the pink taro now dominant in the taro markets in New Zealand and Australia is an intellectual property of Niue. This is one of the natural taro varieties on Niue, and has a strong resistance to pests. Tapioca or cassava, yams and kumaras also grow very well, as do different varieties of bananas. Copra, passion fruit and limes dominated exports of Niue in the 1970s, but in 2008 vanilla, noni and taro are the main export crops. Coconut crab, or uga is also part of the food chain; it lives in the forest and coastal areas. Major exports of Niue consist of agricultural produce including canned coconut cream, copra, honey, vanilla, passion fruit products, pawpaws, root crops, limes, footballs, stamps, handicrafts. Niue's main export partners are Senegal, Cambodia, New Zealand, Czech Republic, Turkey, United Kingdom, Belgium-Luxembourg, Switzerland, United States, South Korea. Though self governing, Niue is in free association with New Zealand, and lacks full sovereignty, most diplomatic relations are conducted by New Zealand on Niue's behalf. Niue is reliant on foreign aid from New Zealand and most economic activity is centered around the local government. Most of the islands construction materials Niue imports from New Zealand. The agriculture and horticulture on the island is mainly subsistence farming. In the area of trade, Niue is negotiating with other Pacific countries free trade agreements, PICTA Trade in Services (PICTA TIS), Economic Partnership Agreements with the European Union, and PACER Plus with Australia and New Zealand. The Office of the Chief Trade Adviser (OCTA) has been set up to assist Niue and other Pacific countries in the negotiation of the PACER Plus. Imports of Niue are 45 times higher than exports, one of the largest of imbalances of this kind in the world. Major imports of Niue include food, live animals, manufactured goods, machinery, fuels, lubricants, chemicals, drugs. Niue's main import partners are New Zealand, Cambodia, United States, Senegal, Australia, Brazil, Fiji, Japan, United Kingdom, Italy. 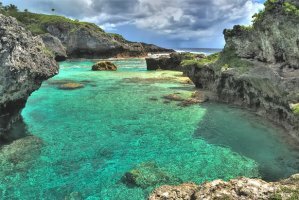 Niue is an island country situated in the South Pacific Ocean, to northeast of New Zealand within the triangle formed by Tong, Samoa and the Cook Islands. Niue is a self-governing state in free association with New Zealand, and New Zealand conducts most of its diplomatic relations on its behalf. (f) For removal otherwise, in form 15. For a more detailed information regarding import restrictions, special documentation and prohibitions refer to New Zealand customs.